Flooring The Consumer: Buying decisions: From the heart or the mind? Buying decisions: From the heart or the mind? 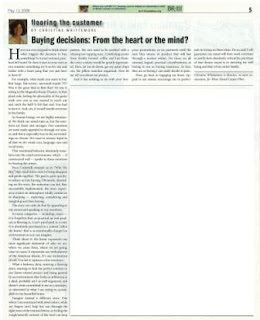 My latest article titled "Buying decisions: From the heart or the mind?" appeared in the May 12, 2008 issue of Floor Covering Weekly. Have you ever stopped to think about what triggers within you the decision to buy something? Is it your rational, practical left brain? Or, does it start in your eyes as you consider something, try it on for size and realize with a heart-pang that you just have to have it? For example, what made you want to buy that large, flat screen, surround-sound TV? Was it the great deal at Best Buy? Or was it sitting in the Magnolia Home Theater, in that plush sofa, feeling the physicality of the game wash over you as you wanted to reach out and catch the ball? It felt that real. You had to have it. And, yes, it would benefit everyone in the family. As human beings, we are highly emotional. We think our mind rules us, but the emotions are faster and stronger. Our emotions are most easily appealed to through our senses, and this is especially true in the surroundings we choose. We react to sensory input in all that we do: visual cues, language cues and vocal tones. That emotional behavior absolutely translates into the retail environment, which – if constructed well – speaks to those emotions by feasting the senses. Paco Underhill reminds us in "Why We Buy" that retail stores exist to bring shoppers and goods together. The goal is quite specific: to seduce us into buying. Obviously, depending on the store, the seduction can fail. But, successfully implemented, the store experience creates an atmosphere totally conducive to shopping -- exploring, considering and imagining and then buying. The store can only do that by appealing to our senses and speaking to our emotions. In many categories – including carpet – it is forgotten that, as practical an end product as flooring is, it isn’t purchased in a void. It is absolutely purchased in a context [often the home] that is as emotionally charged an environment as you can imagine. Think about it: the home represents our most significant statement of who we are, where we come from, where we are going, what we want. It represents our embodiment of the American Dream. It’s our declaration of self. You bet it captures a few emotions. What a let down, then, entering a flooring store, wanting to find the perfect solution to our home-related project and being greeted by an environment that looks as utilitarian as a shed, probably isn’t as well organized, and doesn’t seem committed to me as a customer, or interested in what I am trying to accomplish in my beautiful home. Imagine instead a different store. One where I am entranced with jewel colors, while my hand can’t help running fingers through the tight twist of the textured frieze, or feeling the rough/smooth contrast of the level-cut-loop pattern. My ears want to be soothed with a relaxing toe-tapping tune. Comforting scents from freshly brewed coffee and hot-from-the-oven cookies would be greatly appreciated. Here, let me sit down, get my paint chips out, the pillow swatches organized. Now let me tell you about my project. And it has nothing to do with your low price promotions, or no payments ‘til the next blue moon, or product that will last through a nuclear winter. For those are all rational, logical, practical considerations, as boring to me as buying insurance, in fact, so boring that I can easily decide to pass. Now, go back to engaging my heart. Appeal to my senses; encourage me to participate in trying on these ideas. Do so, and I will guarantee that my mind will then work overtime to justify how absolutely critical the purchase of that dream carpet is to ensuring my well-being and that of my entire family. As I was reading your post, I was seeing that IKEA commercial where the couple is having an animated discussion in the living room... of the store. That is exactly how they sell their furniture - they tell a story with the display. Another ad had a group in lab coats decorating a train car. That's the concept. Putting the home and ambiance around the things for sale. 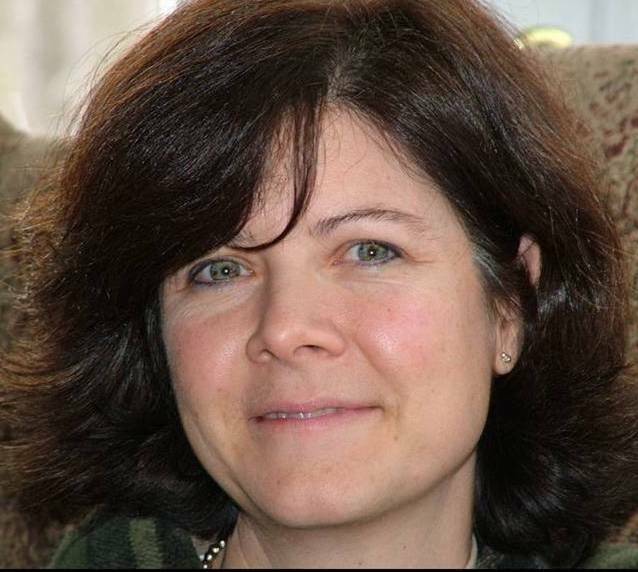 Valeria, those are terrific examples showing how both heart and mind interact in the decision-making process. Thanks for sharing them. Your Brand Wanted: Dead or Alive!